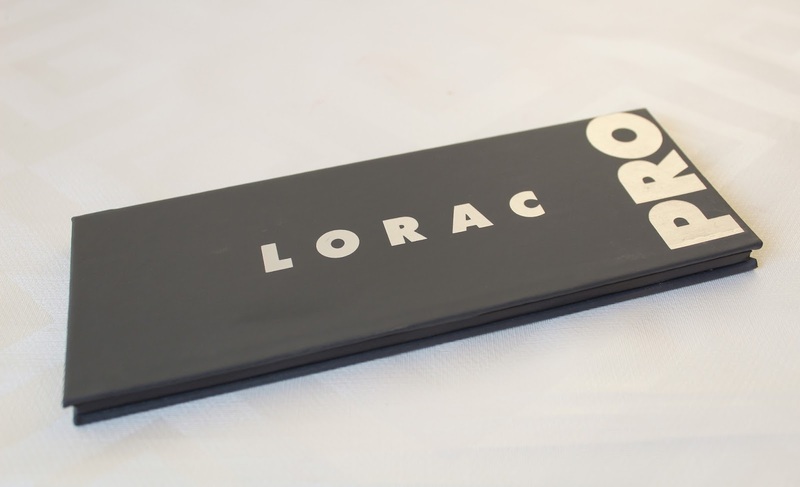 Today, I am so excited to share a review and swatches of the Lorac Pro 2 eyeshadow palette! I have been dying to get my hands on this for such a long time, and I finally did on Boxing Day in the sales! 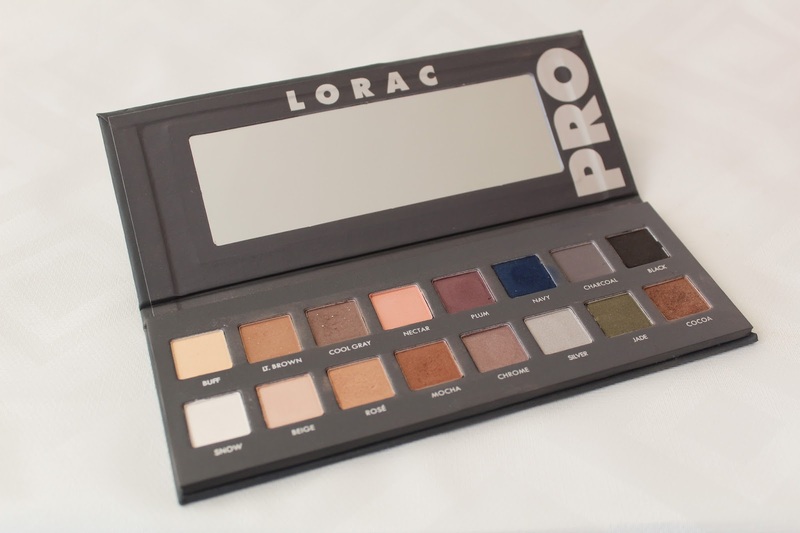 The original Lorac Pro Palette is one of the most popular eyeshadow palettes out there, and beauty blogs all over the world sing its praises and the Pro 2 is a follow up from the original. This palette provides a more expanded selection of neutral colours and also has 2 pops of colour. The shadows in this palette are really rich in pigment which is always a plus, and while most people wear some form of eye primer underneath to keep the shadows lasting longer, these eyeshadows can stand alone for a long time without creasing, which is another plus. Most of the shades run neutral in undertone and colour which means that they're not too warm and not too cool toned either. They are also very wearable for pretty much everyone and you can get both day and night looks from this palette too, which yet again, is another plus. The packaging is nearly identical to the original Pro Palette, expect for the colour, which is now a nice light grey colour. Also, the soft texture of the palette tends to attract any smudges and dirt shows up on it pretty quickly. The '2' on the palette is actually written on the back on the palette in really small writing, took me forever to find it haha! The palette is made from a cardboard type material, has quite a minimalistic design, feels very solid, has a good sized mirror and also has a magnetic flap closure. This palette will be great for when you are traveling because of the slim design and the big mirror. The palette does come with an eye primer, but my mother has stolen it before I could get a photo of it but she really likes it as she has quite oily eye lids and it helps to keep her eyeshadow in place all day long. The pigmentation of the shadows are amazing. This is pretty important to me because I am quite pal so most of the lightest shades would not show up on me but these ones do. I tend to lean towards the more warmer tones that go with my blue eyes and also I feel like warm shadows just look better on my skin tone and flatter it the best. The shadows are very blendable, however, they are a little powdery. So I would suggest to lightly load up your brush and then tap of the excess and then apply, so that you don't get any fall out and also save product. Even though, the fall out tends to go on to the palette itself, which can be easily cleaned. Buff - this is the lightest matte shade in the palette and it is a warm cream with a yellow undertone to it. It is really nice as a base shade all over the lid and it's rich in pigment for such a light colour and blends out really well. Lt. Brown - this is a warm toned, light brown. On my pale skin it looks more of a light caramel colour with a slight tint of orange undertone to it. This is a great transition colour for in the crease and blends out so well. It is really buttery and highly pigmented. Cool Gray - this shade is definitely more on the cooler side. It has a slight purple undertone to it which makes it cool. It is another matte shade and I gravitate to it quite a lot. It feels very buttery but is slightly less pigmented than some of the other shades in this palette, but it is great for layering over another colour. Again, very easy to blend out. Nectar - this colour is a pretty pink-peach shade and it is also such a lovely matte shade to have in a palette like this. Peach colours can be really brightening to a lot of skin tones and also eye colours. I myself don't tend to lean towards these colours due to how pale I am and that it doesn't show up that well on my eye lids. However, it would be a great colour to use as a transition shade and it is soft and blends out really well. Plum - is a warm toned matte purple shade. It is the gorgeous plum shade that you think of when you think about plums. This has that lovely silky soft texture to it and can be blended out or packed on for a more intense look. These colours are great for everyone with different skin tones, for me and my blue eyes it looks lovely blended out into the crease. Navy - this is just simply a dark navy blue matte shade. It looks a lot brighter in the pan but when it is applied to your eyes it is a true navy colour. This is also a really pigmented colour. It's not as soft and buttery as some of the other shadows but it isn't chalky. Because this is so pigmented it can stain the skin, so just be aware of that when applying this colour. Charcoal - this is a neutral toned grey shade. It is nearly the same colour as the packaging of the palette. On my skin tone is does come up quite cool toned a slightly darker that what it swatches but it is still neutral. This is a great versatile shade to have in a palette as it can go lovely with many other shades. It is super blendable and very soft too. Black - this shade, despite it's name, isn't what I would call a true black shade. 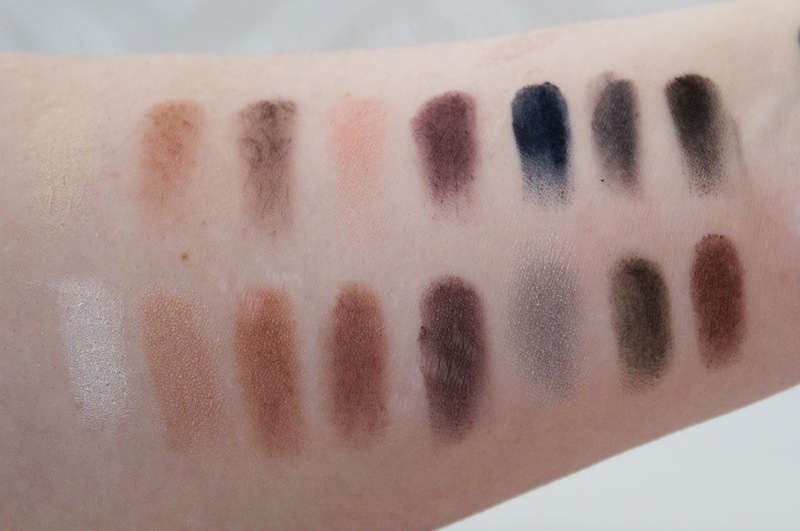 It is more of a deeper version of Charcoal, and hopefully you can see that in the swatches. It is again, really soft and buttery like the other shades, but it could be slightly more pigmented, however, it blends out really well. Snow - this is a frosty white, shimmery shade. It is really smooth and actually a lot more pigmented than I was expecting. When it is blended out it is very beautiful and kind of pearlescent. Beige - is a soft, cool toned beige shimmery shade. It does contain a pink undertone which shows up more on me because I have more yellow undertones. This is really pigmented and you hardly need to touch it to get a decent amount. Again, this shade blends out beautifully and the shimmer in it is gorgeous when the light catches it, but it doesn't have any glitter in it. Rose - this is along the same lines as Beige but it is slightly darker and has a more darker pink undertone to it. It is not as soft as Beige but just as pigmented and easy to blend out. This one also has more shimmer to it than Beige does. Mocha - this is a bronze satin-matte finish with a warm undertone to it. On my skin it looks like a darker matte version of Rose. This shade is so pigmented, soft and easy to blend out and I love to use it in the crease and outer corner to build up definition, this has to be one of my favourite shades! Chrome - is kind of a taupe bronze colour, which swatches more brown and darker than it looks in the palette. This is a satin finish and has a kind of duochrome to it. This is a gorgeous shade too and I do find myself reaching for it quite often. 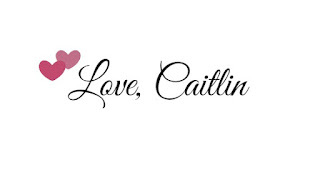 It is super easy to blend out and is really soft and buttery and also doesn't have much fall out. Silver - this is cool-toned metallic silver, just as the name says. It does have a slight blue undertone to it though. This shade is very soft but the pigment can gather up a little if you're not careful. The texture it just as buttery as the other shadows, however there is a lot more fallout with this one, so I just use a little setting spray on my brush and tada, sorted! Jade - this is a warm-toned, olive green with finely milled golden shimmer in it. It looks more Army green than Jade to me. I do not suit greens, they just look terrible on my skin tone, however, I did try this colour out and it didn't look that bad. I don't think I will gravitate to it as much as the other shades in this palette. This shadow does not feel as soft and does not blend out as well as some of the other shadows either, but, it isn't chalky either. Cocoa- this shadow is a rich, warm toned brown colour that does have a slight bronze-y undertone to it. This is sooo pigmented! You hardly have to put your brush in there and the colour payoff is amazing! This again is super soft and buttery and so easy to blend out. Again, this another one of my favourite shades from this palette as it goes well with many of the other shades! I did notice that using the palette everyday it does get messy and it is hard to clean off with a wipe because of the velvet palette, so just bare in mind that it will get slightly messy haha! Overall, I think that the Lorac Pro 2 is an amazing palette and great addition to my collection. It is different from the Original Pro Palette and that will be worth it to a lot of people. The Pro 2 is a lot cooler toned, but still has warm and cool toned shadows and most of them are neutral that you can use for everyday use. I also love that you get a mixture of matte, satin and shimmery shades and the finishes of all them are really nice, finely-milled and not too chalky or glittery. There is also enough shades for you to do a bronze/brown smokey eye or a grey/silver smokey look, this palette is just so versatile. There are also shades like Nectar, Jade, Plum and Navy that you can use for a fun everyday look that stray from the neutal territory. I did get this palette from Amazon UK as I couldn't find anywhere else in the UK that sell this palette. This retails for around £40, which is slighty pricey, but you get what you pay for as the shadows are amazing and you can use every single colour in this palette. 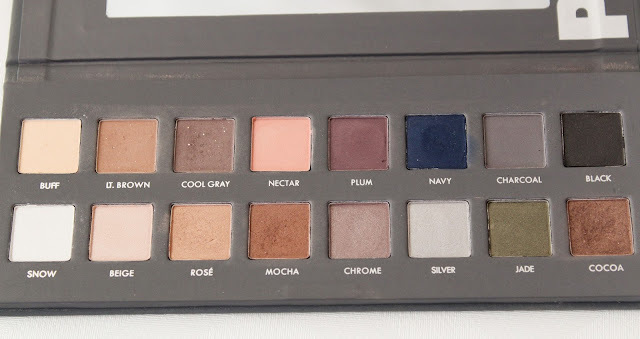 Have you tried this palette out? Let me know your thoughts! Also, what is your favourite go to eyeshadow palette?